Gain an advanced education and training in the biological sciences, within the context of a range of human diseases that affect a significant proportion of the global population. The programme provides training in the modern practical, academic and research skills that are used in academia and industry. Through a combination of lectures, small-group seminars and practical classes, you apply this training towards the development of new strategies to combat the spread of infectious diseases. You learn skills in experimental design using appropriate case studies that embed you within the relevant research literature. You also gain experience of analysis and statistical interpretation of complex experimental data. The programme culminates with a research project under the supervision of faculty that currently perform research on disease-causing microorganisms. 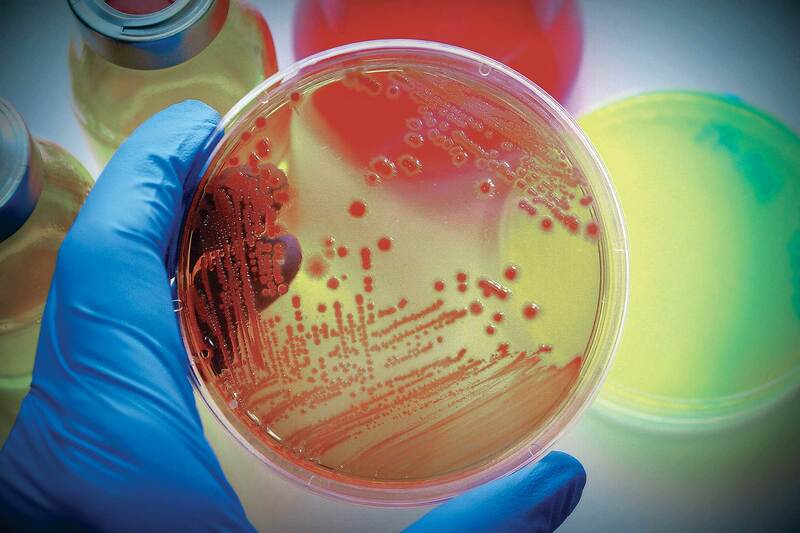 Dr Mark Shepherd talks about combating antibiotic-resistant bacterial infections. The University of Kent’s School of Biosciences ranks among the most active in biological sciences in the UK. We have recently extended our facilities and completed a major refurbishment of our research laboratories that now house over 100 academic, research, technical and support staff devoted to research, of whom more than 100 are postgraduate students. Research in the School of Biosciences revolves around understanding systems and processes in the living cell. It has a strong molecular focus with leading-edge activities that are synergistic with one another and complementary to the teaching provision. Our expertise in disciplines such as biochemistry, microbiology and biomedical science allows us to exploit technology and develop groundbreaking ideas in the fields of genetics, molecular biology, protein science and biophysics. Fields of enquiry encompass a range of molecular processes from cell division, transcription and translation through to molecular motors, molecular diagnostics and the production of biotherapeutics and bioenergy. KMMS will be a significant addition to the University, with exciting opportunities for education and research in the School of Biosciences. The MSc in Infectious Diseases involves studying for 120 credits of taught modules, as indicated below. The taught component takes place during the autumn and spring terms. You will undertake a period of advanced training in research, technical and transferable skills with application in medical microbiology area, including an extended practical training in cutting-edge genome editing. This training will be harnessed with a range of modules specialising in advanced studies of infectious disease. A 60-credit research project takes place over the summer months. The assessment of the course will involve a mixture of practical classes, innovative continuous assessment to gain maximum transferable and professional skills, and examinations. In addition to traditional scientific laboratory reports, experience is gained in a range of scientific writing styles relevant to future employment, such as literature reviews, patent applications, regulatory documents, and patient information suitable for a non-scientific readership. The modules listed below are indicative of those offered on this programme. This list is based on the current curriculum and may change year to year in response to new curriculum developments and innovation. All modules listed below are compulsory – this programme does not have any optional modules. The module aims to develop an in depth understanding of fungal pathogens, based around lectures and interactive workshops. Key topics include severe, recurrent and chronic fungal diseases (such as cryptococcal meningitis, candidiasis and chronic pulmonary aspergillosis).and molecular mechanisms underlying resistance to anti-fungal drugs. The module will involve a rotation of seminars covering key theoretical concepts, mechanistic insights into host:pathogen interactions, and discussion of practical approaches to combat the spread of fungal infections. These will be accompanied by interactive workshops wherein students will analyse, present and discuss the relevant research literature. The students will gain experience in scientific design, literature analysis, scientific communication and the analysis and interpretation of complex experimental data. The module aims to develop an in depth understanding of eukaryotic pathogens, based around lectures and interactive workshops. Key topics include: Introduction to parasitology (parasitism as a strategy), Evolution and taxonomy of parasitic protozoa, Cell structures and functions, Molecular biology of parasitic protozoa, The unique biochemistry of parasitic protozoa, Apicomplexa (Plasmodium, Toxoplasma, Babesia, Cryptosporidium), Parasitic Excavates (Trypanosoma, Leishmania, Naegleria, Trichomonas), Overview of medically important helminths, Host-parasite-vector immune interactions. The module will involve a rotation of seminars covering key theoretical concepts, mechanistic insights into host: pathogen interactions, and discussion of practical approaches to combat the spread of parasitic infections. These will be accompanied by interactive workshops wherein students will analyse, present and discuss the relevant research literature. In addition, a laboratory workshop will provide training for the identification of medically important parasites using microscopy and molecular biology techniques. The students will gain experience in scientific design, literature analysis, scientific communication and the analysis and interpretation of complex experimental data. The module aims to develop understanding and analytical skills in virology, based around seminars and interactive workshops. The initial stages of the module will involve an intensive rotation of seminars covering key practical and transferable skills in virology and molecular biology. These will be accompanied by interactive workshops wherein students will analyse, present and discuss the relevant research literature. The students will gain experience in scientific design, literature analysis, scientific communication and the analysis and statistical interpretation of complex experimental data. Science has a profound influence on professional practice in the private and public sector. This module considers the ways in which different professions interact with science and scientists, and how this influences the work they do. Their interaction with the public will also be discussed. A series of speakers with diverse professional backgrounds (education, industry, government, policy making, the law, the media) will describe their work, the role of science in the profession, and the way in which science influences their actions and interactions with the public and other professions. This will relate to scientific content in a range of scientific contexts, including cancer, reproductive medicine, biotechnology and healthcare. This will be illustrated by case studies presenting challenges and dilemmas concerning the communication of science in the context of different professions and their target audiences. The module aims to develop understanding and practical skills in molecular biology, based around interactive workshops, practical sessions and group work . The module will involve practical sessions covering key practical and transferable skills in molecular biology and biotechnology. These will be accompanied by interactive workshops and classes that review the theory of these techniques, and will use case studies to illustrate their impact and importance in both academic and industrial settings. Students will learn skills in experimental design using appropriate case studies that will embed them within the relevant research literature. They will also gain experience of analysis and statistical interpretation of complex experimental data. Students will undertake an independent research project that will be designed by the student, in consultation with an academic supervisor, to address specific research questions. Students will be trained in key techniques relating to the project, and will work independently under the supervisor's guidance to design and execute experiments that will address the questions formulated earlier. The students will spend approximately 14 weeks in the laboratory and with then write up their findings in the style of a scientific report for publication in a high impact factor scientific journal. They will present a poster and an oral presentation in research symposia arranged by the School. Assessment is by examination, coursework and the research project. promote an understanding of the impact of scientific research on society and the role for scientists in a range of professions. how scientific knowledge is disseminated to different stakeholders: eg, media, policy-makers and public. statistical evaluation: the use of appropriate statistical analysis methods in handling scientific data. careers: a recognition of career opportunities for scientists outside of the laboratory. team work: the ability to work both independently and as part of a research group using peer support, diplomacy and collective responsibility. The MSc in Infectious Diseases provides advanced research skills training within the context of diseases that affect significant proportions of the UK and global populations. With the UK being a world leader in infectious diseases research and pharmaceutical development, and Kent having a strong research focus in this area, there are significant opportunities for career progression for graduates of this programme in academia (PhD) and industry. There are also opportunities for careers outside the laboratory in advocacy, media, public health and education. To give you an idea of possible career destinations, recent graduates have gone on to the following roles: Healthcare Scientist at Public Health England, QC Microbiologist at ThermoFischer, Medical Lab Assistant at Guy’s Hospital, Environmental Health Technician in the Royal Air Force, Microbiologist at Leatherhead Food Research, and onto PhDs at the University of Kent, Lancaster University and University of Southampton. The School of Biosciences has a dedicated Placements and Employability Officer and your academic supervisor will be able to advise you and give you access to professionals in their network. These services are available to you for 3 years after completing your course. This programme has been accredited by the Royal Society of Biology. Masters Accreditation by the Society recognises programmes that support the development of specific skill sets, competencies and training which will enhance life and health science research. Programmes submitted for accreditation must satisfy the general requirements for Advanced Accreditation, which includes a significant period of practice. Students on taught programmes are assigned a personal academic tutor to provide additional support in their postgraduate study. Throughout the course, you are fully embedded in the research culture of the School by attending research seminars and careers guidance sessions, and also participating in our vibrant outreach programme within the local community. In addition to taught modules, an in-depth research project takes place during the summer under the guidance of members of academic staff. These projects benefit from our outstanding research environment and first-class facilities. Minimum 2:1 honours degree in a biosciences-related subject.